This study was conducted in farm conditions in order to reveal the distribution of spawning time and spawning time repeatability in rainbow trout. The spawning times of 48 farms in Eastern Blacksea Region of Turkey were analysed. Separately, the broodstocks of two farms, selected from these farms, were spawned individually and marked group by group according to spawning time/party. Therefore, one year later, when these fish spawned, their spawning characteristics were determined. It was determined that spawning time of rainbow trout showed a distribution between September and May in the region, and in (70%) of these farms spawning continued between December and March when egg strip was performed. Furthermore, it was found out that the rate of repeatability of spawning time was high in one year later (incoming year). When compared with former year, it was found out that rainbow trout spawned 15 days earlier or later. In Turkey, rainbow trout has been cultured since 1970’s and still has been a popular species in aquaculture (Okumus, 2002). According to State Institute of Statistics 2006 data, 12615 tons of 128943 tons total (57659 tons rainbow trout) aquaculture production was produced in Black Sea Region’s cage farms and land based ponds. When evaluating in the basis of species, it is seen that the trout produced in Black Sea Region constituted 22% of total trout culture production in Turkey (Anonymous, 2006). The necessary characteristics that should be known are spawning or stripping time and its repeatability one year later in rainbow trout. Different rainbow trout strains have different spawning times worldwide (Bromage and Cumaranatunga, 1988). In rainbow trout production, egg stripping time is focused on limited time which causes increase or decrease of egg production in certain times and therefore, fish price balance is corrupted. So producers have to find or produce eggs/fingerlings throughout the year. To solve this problem, different approaches are available. Some of these approaches are to get summer eggs from abroad or to supply summer eggs using photoperiod. If photoperiod is practiced, choosing broodstock, timing and timing regulation will be very important key points and should be chosen carefully. Another approach to supply egg in different times is to benefit from the strains having different spawning times. This application doesn’t require either extra cost or an addition investment; even because it is a way that does not include handling the brood stock directly, it is a preferable way. Rainbow trout like other salmonids have an annual reproductive cycle under ambient condition. This means naturally it gives its eggs with only one spawning once a year and each trait has a tendency of spawning in a certain time (Quinton, 2001; Sadler et al., 1992). In studies, broodstock availability should be known from the start. There are some studies focusing on spawning time and its repeatability, and these studies showed spawning time is highly repeatable (Sadler et al., 1992; Fishback, 1999; Quinton, 2001; Quinton et al., 2004). In this study, it was aimed to determine the distribution of the spawning time of rainbow trout in Eastern Black Sea Region and to expose the repeatability of the spawning time one year later in two selected farms and provide information for future breeding studies. The study was made in certain trout farms which have fingerling production units in Eastern Black Sea Region of Turkey in 2001-2003. Spawning times were determined by visiting the farms in person and taking the data from the farms’ owners. In two farms representing Eastern Black Sea Region, it was determined which fish spawned one year later, by applying group marking according to the spawning time of broodstock stripped in years 2001-2003. These farms were big enough for representing Eastern Black Sea Region. One of the farms was in mantioned Farm I (40°46’39.2’’ N; 39°37’38.2’’E), and the other was mantioned as Farm II (41°05’57’’ N; 41°02’38’’E). The water parameters (pH, nitrite, nitrate, ammonia, hardness, oxygen, alkalinity, carbon diokside) were analyzed monthly. Water temperature was measured daily, water analyses were determined according to APHA (1985) and Egemen and Sunlu (1999). 106 female broodfish in the Farm II and 445 broodfish in the Farm I were used in the study. Each fish was marked with visible implant fluorescent elastomer dye by being injected fish’s transparency area behind the eye. Fish was marked the same color dye and the same area according to spawning party which is called “group marking”. Therefore, 4 different marked groups in the Farm II, and 6 different marked groups in the Farm I were formed. Stripping times of 48 farms were determined in the Eastern Black Sea Region. It was reported by the owner of a farm that stripping was been realized during 9 months and the broodstocks spawning in abnormal time had been selected from fries hatching summer eggs brought from South Africa. Of farms, per cent 77% in January, 63% in February, and 56% in November had egg stripped. In general, that spawning time was between November and April and most farms completed the egg stripping in one or two months was determined. While water temperatures in the Farm I varied between 3-19°C, in the Farm II it was between 2-18°C (Figure 1). During the study, monthly water analysis parameters were given in the Table 1, separately for the farms either Farm II and in Farm I. The goal of this study is spawning times and repeatability of the spawning time one year later. After ovulation, by taking into consideration that the eggs can be protected in abdominal cavity; egg stripping was done by controlling the maturity of the brood stocks about 14 day’s intervals as mentioned Azuma et al., (2003). In the first year, in every group of all fish stripped was marked with different color dye in the determined body area by using group marker. The Farm I, in the first year, 6 groups egg stripping. In the second year, 7 groups egg stripping was realised. The Farm II, in the first and second year, 4 groups stripping was realized. Therefore, in the result of marking, it was determined which fish spawns in which spawning period. In the spawning season, spawning party and fish numbers were presented in Figure 2 and Figure 3. Spawning fish numbers were high comparing to the beginning and finishing spawning seaseon. The Farm I first spawning period started on 18 December 2001 and finished on 16 March 2002 and all broodstock fish was stripped in 6 spawning period with 15-20 day intervals. In incoming year stripping started on 7 December 2003 and finished on 2 March 2003 in 7 spawning period with 15-20 day intervals (Table 2). The Farm II, in the first year stripping starting on 1 January 2002, finished on 2 March 2002 and in 4 spawning period, all broodstock fish was stripped. Incoming year, starting on 12 January stripping went on till 8 March 2003 and again in 4 spawning period (Table 3). In each of the two farms, it wasn’t seen any brood stock not giving eggs. In both the years, according to spawning period brood stock fish number was given in Figure 2 and Figure 3. In some stripping groups, it was seen that the stripping time could be later or earlier. For example, the Farm I during 2001-2002 production period, in a group, 18.4% of the 22 broodstock stripped first, 44.9% second and 14.3% third parties. However, in 2001-2002 production periods ,being 18 December stripping date of the first party became on 7 December incoming year and second stripping became on 21 December. According to this result, 45% of the brood stocks stripped on 18 December in 2001-2002 was stripped almost at the same date (Table 3). In the Farm II, majority of the brood stocks spawned 15 days earlier or later or almost at the same date comparing to the former year. For example, 89% of the brood stocks spawning in the first year spawned again in the first spawning period incoming year (Table 4). In here especially in 2001-2002 season, majority of the brood stocks stripped as second and third party lasted a party former incoming year. For example in the first year, 54.3% of brood stocks stripped in the second party were stripped in the first party in incoming year. Similarly, majority of the third party (43.5%) lasted to the second party incoming year. Rainbow trout spawns once a year at one time under natural condition and there are different strains on the earth. One of them is a winterspring spawner and the other one is a summerautumn spawner (Fishback, 1999). Rainbow trout stocks cultured world-wide today carry both strains’ gene. At the result of geographic conditions they are transferred in. culture condition and conscious or unconscious selection they are exposed to; spawning time is distributed during a year in the world. Of them, water temperature and photoperiod play an important role in altering spawning time and also their control is easier. It’s stated that rainbow trouts are spawned twice a year or three times in two years with photoperiod and temperature control (Quinton, 2001; Bromage et al., 1992). Nowadays, by using photoperiod techniques most European fish farms make brood fish spawn in different seasons and so eggs are obtained during all year (Bromage, 1995). It’s known that. in culturing individuals which have desired characteristics, using their seeds from them is the most practical and relatively the most successful approach by selecting family and individuals which have these characteristics. It’s possible to form fast growing and early/late spawns stocks in this way. Trouts spawn once a year at one time and spawning seasons are different for each strain. It was observed that strain fries spawn at the same time as their parents by using estimate heritability. Heritability was reported as approximately 0.5 and more than that (Sadler et al., 1992; Fishback 1999). Fishback (1999) observed the effects of environmental and genetic factors in rainbow trouts by using genetic markers and reported genetic differences among groups spawning at four different seasons (spring. summer. autumn and winter). He stated that 11 fish individuals of 29 samples spawned in two weeks, 4 fish spawned in three weeks, one spawned in four weeks, one spawned in five weeks and one spawned twice a year. As stated before, spawning time and its realization in all months of year is a necessary event for fish culturists. To make fries and eggs available in farms every month of year raises farm profits to an important extend. However, as well as concern and experience suitable conditions are necessary in order to success it. Consequently, to expand spawning seasons as possible and to have equal brood fish number at each spawning time cause both farm management to be more regular and labor-work to decrease by preventing backlog of work at certain months. Early spawning or making early spawn stocks for Black Sea region are desired. In this region, trout consumption increases during summer months. Sometimes, demand for it isn’t met, and so porsion-sized fish can decrease (200-250 g) in summer. If early spawning obtained, this problem can be solved. More-over, in the case of putting fingerlings into sea cages for production in November, provides us with rising for 7 or 8 months and so fish grow as big as one kilogram. In this study, repeatability of brood fish spawning time in the following year was determined by using group marking. When repeatability of it was estimated a week after or before that, it was observed that most of brood fish spawned at the same time. Fishback (1999), Sadler et al., (1992), Quinton et al., (2004) were determined the similar results. There were deviations in a few numbers of them. Quinton et al., (2004) stated that spawning date could be earlier for older fish. if environmetal factors could be controled. However, unless an excessive change in environmental conditions happens in compared with the previous year, it is said that fish may spawn at the same time. In the study, according to the farms, spawning times were determined. Spawning season varied to 9 months only in a farm. In the others, spawning season lasted for 1 or 2 months. That a hundred brood fish were spawned at a time even in someof them was determined. Especially in the Farm I, it was obvious that the number of fish spawned at the third and forth a season was excessive (Fig. 2). It was observed that 49 brood fish spawned in this farm in the first year of the study decreased. In fact, the spawning time in the second year came 12 days earlier and so some could be spawned and in the second spawning the rest were spawned (Table 3). Most of farms in the region are in the same position. In other words, when spawning time comes, a few fish can be spawned at the beginning and finishing seasons and more fish are spawned between them. As a result of that, density in incubation unit increases and the care of eggs and fries becomes difficult. A distribution close to ideal in the Farm II was observed. Pre-planning of both that there isn’t intensity in incubation and production and when and how many fries are needed can be made easily by adjusting their distributions according to brood fish numbers in spawning time. Fish farmers that spawn broodstock more than two seasons should able to predict individual future spawning dates based on past dates and past data but should be aware that the entire spawning season may change some environmental condition which alter gonadal development. This research was funded by Karadeniz Technical University Graduate School of Natural and Applied Sciences (Project no: 2001.117.001.6). APHA (American Public Health Association), (1985), Standard Methods for the Examination of Water and Waste Water. 16th ed., Washington. DC. Azuma, T., Ohta, H., Oda, S., Muto, K., Yda, T., Unuma, T., (2003), Changes in fertility of rainbow trout eggs retained in coelom. Fisheries Science, 69: 131-136. Bromage, N., Cumaranatunga, R.C., (1988). Egg Production in the Rainbow Trout. In: J.F. Muir. R.J. Roberts (eds. ), Recent Advances in Aquaculture. Croom Helm. London, 3. pp. 63-138. Bromage, N., (1995), Broodstock management and seed quality-General considerations. In: N.R, Bromage and R.J. Roberts (eds. 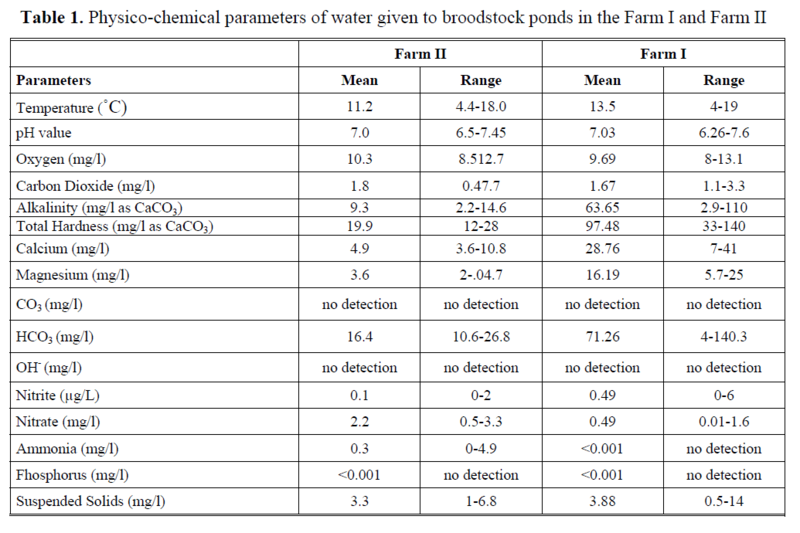 ), Broodstock Management and Egg and Larval Quality. Blackwell Sci, pp. 1-24. Bromage, N., Jones, J., Randall, C., Thrush, M., Davies, B., Springate, J., Duston, J., Barker, G., (1992), Broodstock Management, Fecundity, Egg Quality and Timing of Egg Production in the Rainbow Trout (Oncorhynchus mykiss). Aquaculture, 100: 141-166. Anonymous. (2006), Fisheries Statistics. State Institute of Statistics, Prime Ministry Republic of Turkey. Egemen, O., Sunlu, U., (1999), Water Quality (textbook), E.U. Faculty of fisheries, Publication no:14, E.Ü. Press, Bornova, 148 pp. (in Turkish). Fishback, A.G., (1999), Genetic and environmental influences on the spawning time and progeny growth of hatchery rainbow trout. MSc Thesis, University of Guelph, 108 pp. Okumuş, İ. (2002), Rainbow trout broodstock management and seed production in Turkey: Present practices, constrains and the future. 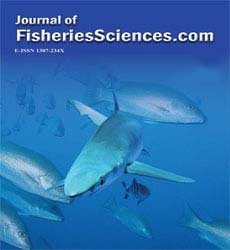 Turkish Journal of Fisheries and Aquatic Scince, 2: 41-56. Quinton, C.D., (2001), Growth rate and spawning time in diallel crosses of three strains of rainbow trout (Oncorhynchus mykiss). MSc. Thesis, Canada. 105 pp. Quinton, C.D., McKay, L.R., McMillan, I., (2004), Strain and maturation effects on female spawning time in diallel crosses of three strains of rainbow trout (Oncorhynchus mykiss). Aquaculture, 234: 99-110. Sadler, S.E., Mc Leod. D., McKay. L.R., Moccia., R.D., (1992), Selection for early spawning and repeatability of spawn date in rainbow trout. In: G.A.E. Gall, (ed. ), The Rainbow Trout. Elsevier, pp. 103.